2 | Boating Safety Info: 402-471-5462 NEBRASKA GAME AND PARKS COMMISSION OFFICES HEADQUARTERS/SOUTHEAST District 2200 N. 33rd St. Lincoln, NE 68503-0370 402-471-0641 SOUTHWEST District 301 E. State Farm Road North Platte, NE 69101-0430 308-535-8025 NORTHEAST District 2201 N. 13th St. Norfolk, NE 68701-2267 402-370-3374 NORTHWEST District Kearney Service Center Bassett Service Center Omaha Service Center 299 Husker Road 1617 First Ave. 524 Panzer St. 8495 Frederick St. Alliance, NE 69301-0725 Kearney, NE 68847-6057 Bassett, NE 68714-0508 Omaha, NE 68124 308-763-2940 308-865-5310 402-684-2921 402-595-2144 ABOUT THIS GUIDE The Boating Guide is a publication of the Nebraska Game and Parks Commission. 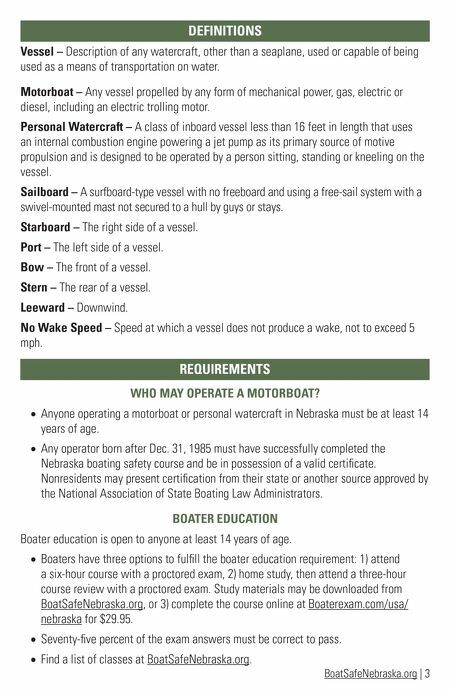 It is a summary of Nebraska's regulations, orders and statutes pertaining to boating and is not intended to be a complete digest of regulations, orders and statutes. 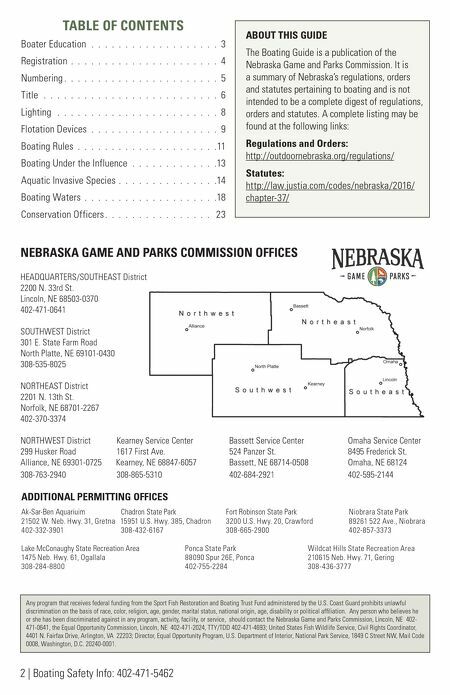 A complete listing may be found at the following links: Regulations and Orders: http://outdoornebraska.org/regulations/ Statutes: http://law.justia.com/codes/nebraska/2016/ chapter-37/ TABLE OF CONTENTS Boater Education . . . . . . . . . . . . . . . . . . . 3 Registration . . . . . . . . . . . . . . . . . . . . . . 4 Numbering . . . . . . . . . . . . . . . . . . . . . . . 5 Title . . . . . . . . . . . . . . . . . . . . . . . . . . 6 Lighting . . . . . . . . . . . . . . . . . . . . . . . . 8 Flotation Devices . . . . . . . . . . . . . . . . . . . 9 Boating Rules . . . . . . . . . . . . . . . . . . . . .11 Boating Under the Influence . . . . . . . . . . . . .13 Aquatic Invasive Species . . . . . . . . . . . . . . .14 Boating Waters . . . . . . . . . . . . . . . . . . . .18 Conservation Officers . . . . . . . . . . . . . . . . 23 ADDITIONAL PERMITTING OFFICES Ak-Sar-Ben Aquariuim Chadron State Park Fort Robinson State Park Niobrara State Park 21502 W. Neb. Hwy. 31, Gretna 15951 U.S. Hwy. 385, Chadron 3200 U.S. Hwy. 20, Crawford 89261 522 Ave., Niobrara 402-332-3901 308-432-6167 308-665-2900 402-857-3373 Lake McConaughy State Recreation Area Ponca State Park Wildcat Hills State Recreation Area 1475 Neb. Hwy. 61, Ogallala 88090 Spur 26E, Ponca 210615 Neb. Hwy. 71, Gering 308-284-8800 402-755-2284 308-436-3777 Any program that receives federal funding from the Sport Fish Restoration and Boating Trust Fund administered by the U.S. Coast Guard prohibits unlawful discrimination on the basis of race, color, religion, age, gender, marital status, national origin, age, disability or political affiliation. Any person who believes he or she has been discriminated against in any program, activity, facility, or service, should contact the Nebraska Game and Parks Commission, Lincoln, NE 402- 471-0641, the Equal Opportunity Commission, Lincoln, NE 402-471-2024, TTY/TDD 402-471-4693; United States Fish Wildlife Service, Civil Rights Coordinator, 4401 N. Fairfax Drive, Arlington, VA 22203; Director, Equal Opportunity Program, U.S. Department of Interior, National Park Service, 1849 C Street NW, Mail Code 0008, Washington, D.C. 20240-0001.